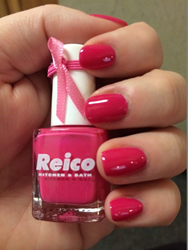 Reico Kitchen & Bath is using Facebook and the community to “Like” away Breast Cancer. Each “Like” received to the Reico Kitchen & Bath Facebook Page will equal $1 donated to support the Breast Cancer Research Foundation. We are excited to interact with the community and use our Social Media efforts to help create awareness and support such an important cause. Reico Kitchen & Bath, the premier kitchen and bathroom distributor in the mid-Atlantic region, has dedicated their Social Media efforts to help fight Breast Cancer. Reico has pledged to donate $1 for each like gained in the month of October to support the Breast Cancer Research Foundation (BCRF). Reico Kitchen & Bath’s goal is to donate $10,000 in the month of October to help fight Breast Cancer. Every Like to the Reico Kitchen & Bath Facebook Page will equate to $1 donated to support the BCRF, which was selected to receive the donation after researching which organizations make the biggest impact and apply the highest percent of dollars to awareness and research. Whether through donations or local projects, Reico is committed to supporting the community. Reico has already lent their support to two projects in the Mid-Atlantic region this year. Reico supported the HelpingaHero.org foundation by contributing kitchen and bathroom cabinets and appliances that aided in the care and day-to-day living of a recovering hero. Reico also contributed kitchen and bathroom cabinets along with vanity tops for a 19 unit townhome community built by Habitat for Humanity Mid-Maryland. Help Reico Kitchen & Bath fight Breast Cancer by liking their Facebook Page. For 60 years, Reico Kitchen & Bath has been the premier distributor of kitchens and bathrooms in the mid-Atlantic region with 21 stores covering VA, MD, DE, PA and NC. Despite being the largest kitchen and bath distributor in the country, the success of Reico is structured around earning the business and appreciation of their clients. Reico Kitchen & Bath’s goal is to have every customer feel confident recommending them. Reico offers full turnkey service, providing cabinets, countertops, appliances, installation and everything else for a kitchen or bathroom project. Come to where the professionals have trusted their own businesses to since 1952, and watch Reico bring the dream of a new kitchen or bathroom to life.